The Investment Tax Credit (ITC) currently pays for 30% of every Solar installation through a tax credit claimed against the tax liability of the solar array owner. The U.S. tax code allows for a tax deduction for the recovery of the cost of tangible property over the useful life of the property. The Modified Accelerated Cost Recovery System (MACRS) is the current depreciation method for most property. The market certainty provided by MACRS allows businesses in a variety of economic sectors to continue making long-term investments and has been found to be a significant driver of private investment for the solar industry and other energy industries. Businesses can write off the value of their solar energy system through using MACRS, reducing their tax burden and accelerating returns on solar investments. Accelerated depreciation can reduce net system cost by an additional 30 percent. Note: The Consolidated Appropriations Act, signed in December 2015, extended the "placed in service" deadline for bonus depreciation. Equipment placed in service before January 1, 2018 can qualify for 50% bonus depreciation. Equipment placed in service during 2018 can qualify for 40% bonus depreciation. And equipment placed in service during 2019 can qualify for 30% bonus depreciation. "a set of devices whose primary purpose is to collect solar energy and convert and store it for useful purposes including heating and cooling buildings or other energy-using processes, or to produce generated power by means of any combination of collecting, transferring, or converting solar-generated energy." M.S. 297A.67, subd. 29. The exemption is very broad and could apply to solar Photovoltaic (PV) systems, solar water-heating systems and solar space-heating systems. All components of these systems are exempt, including panels, wiring, pipes, pumps and racks. Buyers must complete Minnesota Department of Revenue Form ST3 "Certificate of Exemption" in order to claim the exemption. Sellers are required to keep the form in their files for tax reference. A newly-installed solar power system is 100% exempt from associated property taxes. When a solar power system is installed, your property value rises significantly, however, the solar array is property tax exempt. Preserve Cash: Upgrade your property while preserving traditional bank credit and cash for other projects. Low Annual Payments: Long term PACE financing results in low annual payments allowing energy savings to offset PACE payments. Get Tax Incentives and Rebates: With PACE financing the property owner owns the system so they keep all rebates and tax incentives for the improvement. Transfer Lien with Property: PACE lien is attached to the property and can transfer to next owner on sale of the property. Off Balance Sheet: PACE financing is potentially off balance sheet. Consult your accountant for guidance. 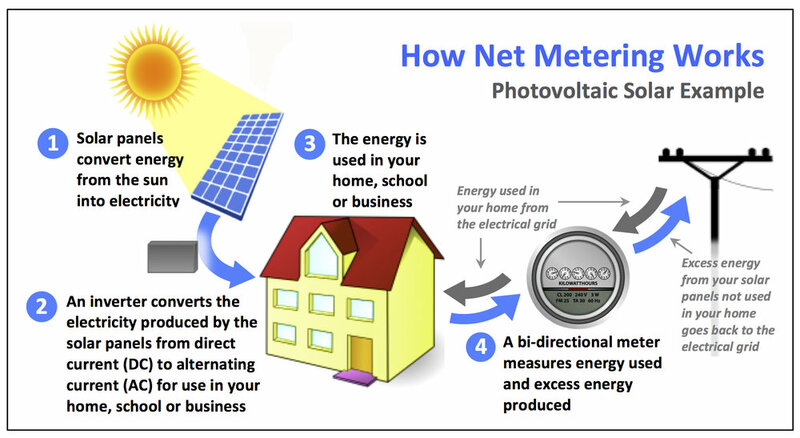 Net metering is a billing mechanism that credits solar system owners for their surplus electricity added to the grid, allowing customers to apply that credit towards electricity they may draw from the grid at another time. In Minnesota, all utilities are required to provide net metering for all solar power systems less than 40 kW. This means utility must compensate customers with systems less than 40 kW in size for net excess generation (NEG) at the "average retail utility energy rate," defined as "the total annual class revenue from sales of electricity minus the annual revenue resulting from fixed charges, divided by the annual class kilowatt-hour sales." Compensation may take the form of an actual payment (i.e., check for purchase) for NEG or as a credit on the customer's bill. For systems sized 40 kW or greater but less than 1,000 kW in size, NEG will be credited at the avoided cost rate. Alternatively, a customer may elect to be compensated in the form of a kWh credit. NEG credits will be reimbursed at the end of the calendar year at the avoided cost rate for customers of investor-owned utilities. NEG credits expire at the end of the year for customers of municipal utilities and electric cooperatives.